From a young age, as much as I was full of laughter I also felt a huge ache I wanted to shield others from. It was the ache of feeling “excluded” and not fully seen. Whether it was due to my female gender, or merely my acute sensitivity, the feeling of isolation was very real for me. I think, as I grew up, that sort of “heal the world” pressure manifested in eating disorders and a very sensitive body system. After finding how intertwined my emotions were to how my body and hormones flowed, I began healing my body inside out through food, self-care, and sharing my story. It was through sharing my story that I realized more firmly than ever my life mission. My mission was to connect through sharing story. Seeing one’s self in another was where the real healing was. When I found IPE, I knew it was my place to train and cultivate my voice as well as my ear to hear other’s more completely. As well as an Eating Psychology Coach, I call myself an Embodiment Coach. Embodiment for me is the agreeing to be in the body and life that you/I was provided and the practice of celebrating this life and opportunity. What I love about this work is the deep openings that are created with those I converse with — whether professionally or in day to day interactions. My work creates the safe space for someone to jump more immediately into their vulnerability without fear of judgment. My business is still new. But what it is currently looking like is that both men and women are interested in these conversations about embodiment and food, about agreeing to be in their life with all their circumstances, and about being at peace with who they are as a man and a woman in this world. My business spreads via word of mouth. At times the work becomes a round table discussion around topics of self shame and prejudices, as well as one on one in person meetings. I intend on my business becoming a conversation series and podcast in fact, truly melding my passion for massive communication and expression (acting and performance have been my life up until now) but about the real nitty gritty areas of life that don’t feel with as much permission to be expressed. It has always been through first-hand experience that I’ve learned my most rock solid life truths. I can be told something a million times, but until I feel it in my bones, I cannot be swayed or truly changed. The Institute’s educational system does not allow you to be a passive student. The education seeps into your ears and pores and gut, and you know by the end of it, as much as you may have nerves about it, that you CAN connect deeply with anyone you encounter. My favorite aspects of the Training were the audio and the live event. I liked to take my audio on walks. To take in nature and a bit of a swirling path helped me digest all the wisdom. I liked to take my audio on my long car commutes about Los Angeles. Each day felt a part of a larger purpose. The live event, however, was the whipped cream to the sundae. After seeing my class of peers in person, I felt the bonds and community strengthen immediately. As someone who has most often worked solo in my life, I learned through IPE, finally, how much more I thrive with community support. Again. I’m new at my work as far as being professionally certified as an Eating Psychology Coach; but feel complete confidence that my life will never be the same, and that financially I am perhaps in for more magic than I yet realize. I have a new language now, a new way of languaging my life experiences that makes me feel more grounded in my own life and in communion with others. I am more gentle with myself now than I was before being a coach. I understand so deeply how my body and the stirrings of my heart and soul are a barometer for how I am living my life, but without the punishment or despair I used to feel when I’d assume I was “off course” with my life. Again, I see my work reaching people massively and yet intimately in the realm of a broadcasted medium. My business will be one that inspires one-on-one conversations to occur between men and women regarding their issues of body and sexual shame. You learn your heart’s language in this work. You heal your familial relationships in this work. You forgive yourself in this work. You remember who you are in this work. The bonds I made with other coaches around the world via this training excites me. I now consider one of my best friends to be a fellow Eating Psychology coach in Vienna, and I cannot wait to create cross cultural work with her. 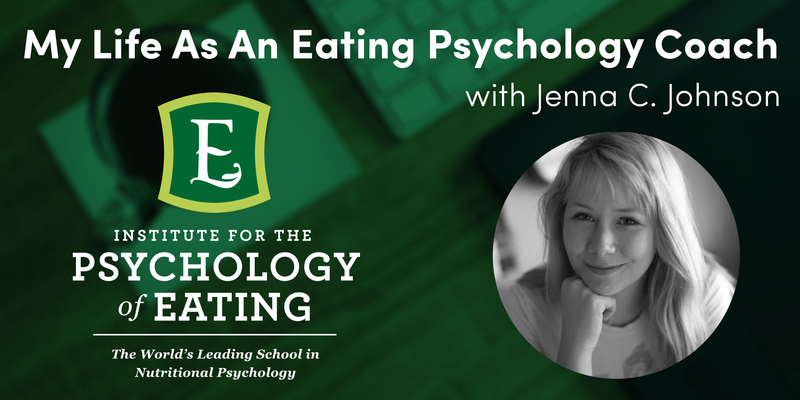 BIO: Jenna is an Eating Psychology & Embodiment Coach in Los Angeles. Her foundational beliefs are that your GREATEST health challenges hold the keys to your GREATEST gifts. The wiser you get, healing the body means healing the heart of where it feels separate from others and from the life you desire. What it has meant for you to be a man or woman in this world is part and parcel of your healing journey. She loves working with men and women, and the areas of disordered binge eating, candida overgrowth, autoimmune symptoms, missing periods, and lineage healing.